Deserts are areas of intensely dry terrain where very little precipitation falls during the course of the year and the environment can be extremely hostile to plant and animal life not specifically adapted to the living conditions. 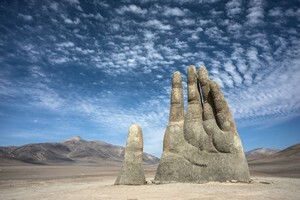 Chile’s Atacama Desert exemplifies the concept in a most extraordinary manner. Situated between the two mountain chains of the Andes and the Chilean Coast Range, the area is one of the driest regions on earth, as the mountains form a near perfect rain shadow. Most climatologists agree Chile’s Atacama Desert is the most arid place on Earth. These scientists define “deserts” as environments receiving less than 250mm of rain annually – the Atacama Desert receives less than 1mm each year. Some areas have had no rain since measurement began. Situated between the Pacific Ocean and the Andes Mountains, the 41,000-square-mile Atacama Desert is made up of salt flats, sandy arid deserts, craggy rock peaks and active volcanoes. There are lagoons in some areas populated by flamingos and the vast salt flats of Salar de Atacama are covered with large pools of water reflecting the surrounding Andes. Small villages dot the landscape but the region is sparsely populated. There are few plants and only a few well adapted animals: Viscacha, a species of fox and the leaf-eared mouse. The soil is so dry and devoid of life NASA uses the Atacama Desert to tests their Mars rovers. 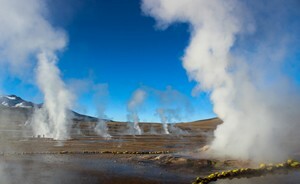 The El Tatio geysers sit 14,173 feet above sea level. Early morning trips from San Pedro treat the visitor to the eruptions of approximately 80 geysers in the cold morning air. The oldest naturally mummified human remains ever discovered in the Atacama Desert predate the Egyptian mummies by thousands of years, as the arid climate preserves the remains of animals and humans alike. Recreational activities and opportunities to take in the startling landscapes abound. The giant sand dunes of Valle de la Muerte are the venue for sand boarding excursions near San Pedro. At Cejar Lagoon, the high concentration of salt creates an impressive ability to float in the buoyant waters. The clarity of the air and lack of atmospheric moisture and light pollution makes for some of the best stargazing in the world. Some of the most advanced telescopes in the world are located in the Atacama Desert, including the Very Large Telescope Array at Cerro Paranal and the Atacama Large Millimeter Array. 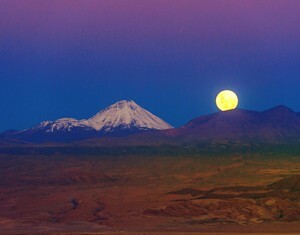 Though stargazers like to avoid full moons, spectacular moonscapes are visible from the Valle de Luna near San Pedro de Atacama. In harmony with the surroundings and local traditions, explora Atacama offers the discovery of the essence of nature and a philosophy of travelling that seeks to satisfy the desire of adventure in an intact universe. On foot, bicycle or horseback, our over 40 explorations inmerse our travelers in the natural and cultural wealth of the Atacama Desert. The hotel’s 17 hectares are part of our conservation program, with which we aim to restore the area’s historical and scientific value. Travel Agents: You can use the content above on your own website or newsletter, compliments of the supplier sponsor above who has paid for your use of the materials. Please take a moment to check out the travel supplier that makes your use of this material possible. To use – right click on this page and choose “View Source”. Copy the HTML and paste the copied HTML into your own webpages or newsletter. You may remove advertising.